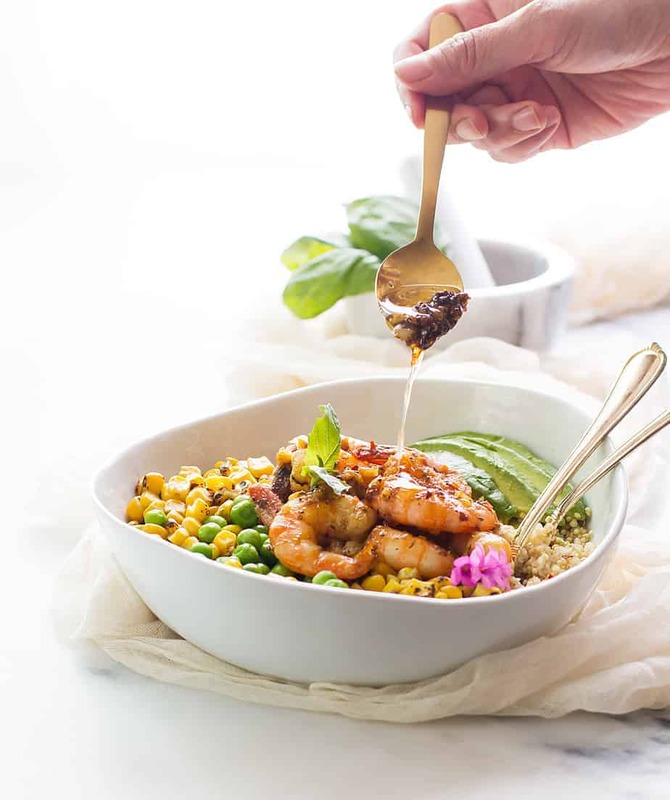 This lemon garlic butter shrimp recipe is a perfect way to cook up shrimp in a tasty and unique way. The shrimp is cooked with four different flavors that come together extremely well: honey, garlic, lemon and basil. Sometimes adding too many flavors in one dish can result in a confusing taste going in too many directions, I don’t find this to be one of those dishes. Lemon is practically a given ingredient when eating seafood, and lemon with garlic is always welcome in my book. The savory basil is aromatic and the honey adds a sweetness and slight texture change that brings a hint of Asian flare. I like that the honey balances out the tanginess from lemon. 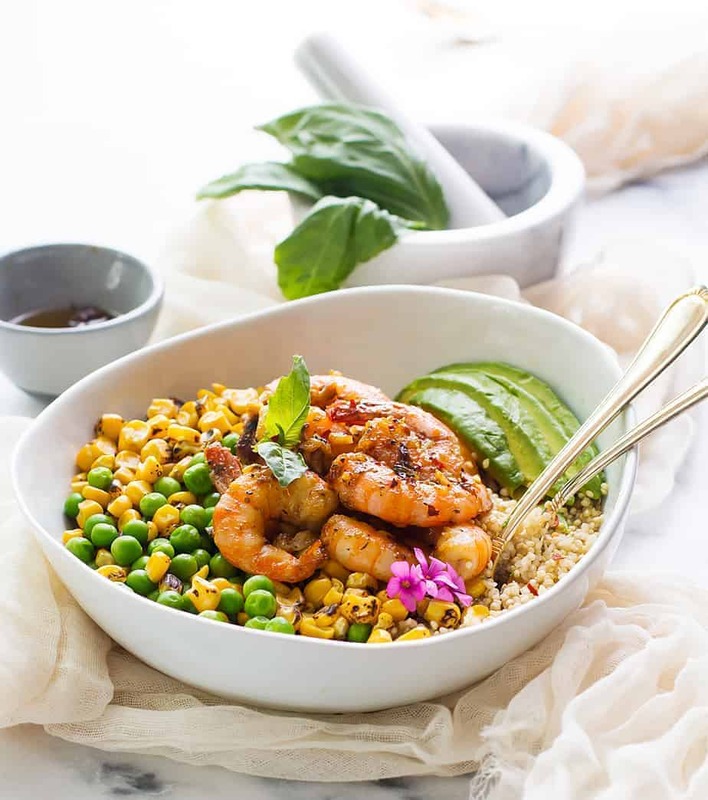 With the shrimp having a high protein content and quinoa added to the dish I consider this to be a great option for a shrimp protein bowl. It definitely mixes it up a bit from the more common chicken and other common protein bowls that you’ll find out there. I didn’t feel like going to the store today so I just grabbed a few other veggies that were on-hand, which included peas and corn (since I have two toddlers I always seem to have a bag of those around!). 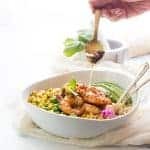 You can enjoy this lemon garlic shrimp with rice or follow my lead with it on top of your favorite salad. Either should taste great. Keep stirring until the shrimp is well cooked, then stir in chopped parsley and turn off the heat. Serve with rice, salad or quinoa with veggies of your choice. Your pictures are beautiful! They make me want to grab the dish right off the screen. I’m a huge shrimp fan so this recipe is on my menu soon. hope you’d enjoy this recipe! What an absolutely delicious looking dish. I love anything with shrimp and would love to try this recipe! Oh my gosh, that looks amazing! I need to cook more with quinoa! Your pictures are amazing. This Lemon garlic butter shrimp looks like a great dish for my family. They love shrimp and I will have to make this for them. I don’t eat shrimp but I do cook it for them. Thanks for sharing the recipe. This photo is gorgeous. Lemon and garlic are two of my favorite flavor combinations. Oh yum! I love shrimp dishes and finding new recipes to make with them. Saving to make soon! Oh wow, this looks delicious! I never think to cook with shrimp even though it is so yummy. This is my kind of meal!!! It looks so clean and so delicious! Shrimp is one of my favourite foods! I love shrimp and I love butter so this is a no brainer for me. The quinoa adds a nice twist. This dish looks amazing and super healthy. I will have to add it to our menu plans for next month. I love shrimp! This has to be one of my favorite flavor combinations when it comes to shrimp! Normally it’s just lemon butter or garlic butter. With the two combined, you can never go wrong! I just bought a pound of shrimp last night. I like to cook them quickly for easy lunches. This looks DELICIOUS!